Creating cohesive brand patterns and components that make your product experience distinctive. We’re back for our 10:30 talk. It’s Kim Williams. She is a leader at Indy.com of a team or teams of designers, engineers, writers and researchers. I met Kim in Munich, I believe it was October, where we both were on a panel talking about design systems. The first day I met her, if there’s a word I had to describe Kim with, it’s effervescence. She’s constantly bubbling with humanity, love, empathy, all these things. She has the qualities that make her feel like a fast friend. And she said, you know, you barely know me, I was like I feel like I’ve known you for years. Big hug. I really love Kim Williams and my interactions I’ve had with her. And the other thing that really inspires me about her is when she talked on the panel, it’s the first time I had ever met her, she’s so smart. She started talking about all the implications with her relationships with all the different people and all the different objectives and outcomes she was producing for the business. 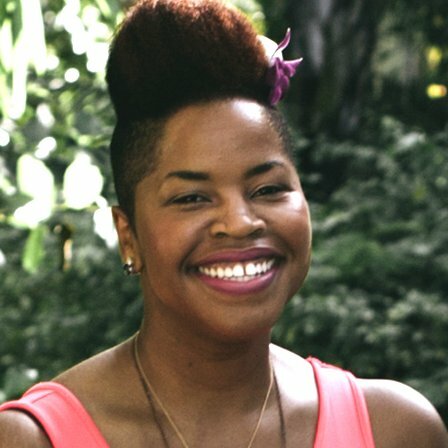 So let’s give some love to Kim Williams and what she’s about to share with us. Thanks so much for that really, really warm introduction, Nathan. Such a pleasure, always. So starting with your brand purpose. So many of you know this reference point Simon Sinek. He talks about the why. Why you show up to work every day, why your company does what it does and why it’s important in the world. 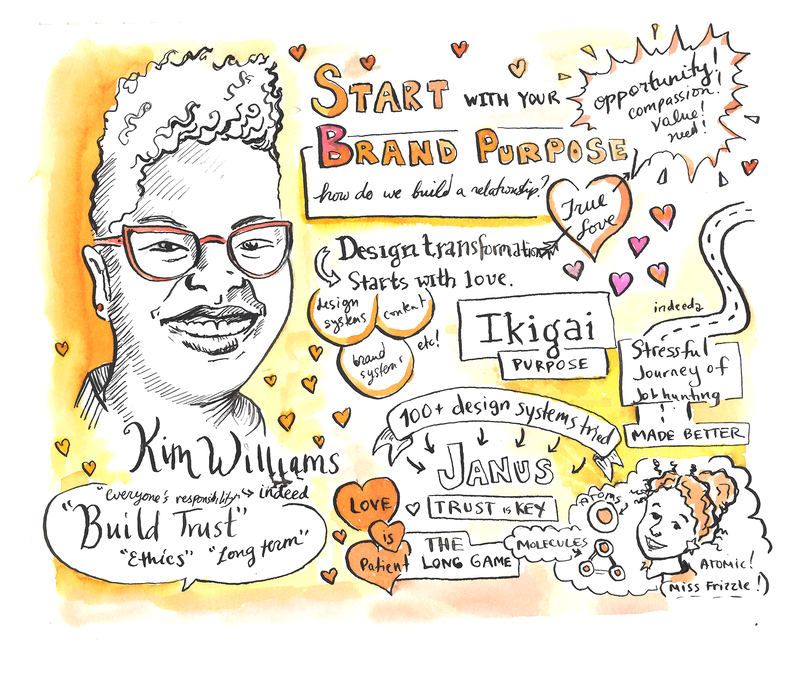 So your brand purpose is really connected to why everyone should love you. And so I would like to start the conversation with what’s a brand that you love and can’t live without? Can I get a courageous volunteer? Just belt it out. Okay. Let’s take Tinder, because that’s how we’re rolling today. So what about Tinder is that you can’t live without? Come on. Nintendo. Okay. What is it about Nintendo that you love? And can’t live without? Nostalgia, it’s universal, it’s fun, it’s friendly. And specifically like why does Nintendo matter to you? Not a lot of fun in my life. So the big opportunity with every brand is that brands embrace empathy, deeply understanding what customers need, like Dan needs fun in his life. And compassion. So it’s never enough to stop at empathy and understanding what people need, it’s important to respond to that with value. So with Nintendo they’re responding to the need for love — I’m sorry, the need for fun, by making these universal and really, really accessible games. And then the last bit here is intimacy and you might think that’s a funny word to use, but really it’s relationship. You know, when you think about Nintendo, it’s such — I’m so glad that came up. My husband is a die-hard Nintendo fan. He’s got everything from that red gun shooter thing with the ducks and the glove and like when we were in Tokyo he was just like well I’ve just got to get to I think they have like a headquarters there. They don’t let you actually go in, but he just went to basically bow down outside of the office. And the guard like allowed him to like basically took a photo of him in front. Anyways, Nintendo is so much a part of his life, it’s how he learned to read so quickly. He was reading those thick manuals of how to learn. So intimacy is relationship. Like my husband has a relationship with Nintendo. So these are the brands that build true love. And most of my talk today is basically going to be about love. And I love this quote about — sorry. From air bnb that it’s better to have a hundred people that love you than a million people that like you. So you’ve probably seen this a ton, but the brand equals the product, the product equals the brand. This is super important for everyone in this room working on design systems. Because they’re not dissimilar things. Everything that the customer, the user experiences is touching the brand. And so the opportunity for Indeed, I’m going to be talking today just about our own personal experience just to share how this applies. So for us we’ve got like the most job seekers, the most jobs in the world, tons of jobs data, millions of transactions per day. So this deep intelligence for job seekers and employers. And so our big question is how do we pivot from someone just coming only for like this emergency room experience of I need a job, I hate my boss today, and then they get it and they go away. Or I need a candidate and I come to Indeed and I get the candidate and I kind of go away, but how do we get to a relationship of when I think about my career, I think about Indeed, when I think about building my team, I think about Indeed. One is transactional and the other is transformational. So what I bring to my company is this talk of building love, empathy, compassion, intimacy with data. Indeed is obsessed with data. We’ve built our own tools to measure, AB test so I’m just bringing in that other half of it, which is love. So design systems are built with love. Every detail, everything that you put into the design system, it is cared for. This is a labor of love. Sometimes depending on the maturity level of your company, you need to almost have a design transformation first just to even get buy-in depending where you are and where you’re at, and when I talk about design maturity, there are different levels. So for level one, for example, it’s the design dark ages. There is no design. Level 3 is like design as a service and level 5 is design as a strategic partner. Design thinking embedded within every facet of the company. But design transformations start with love. So love actually needs to start internally before it can be felt externally. So before Nintendo could do all of those things that light up inside of my husband’s life and everybody that shouted out here, they had to internally believe this. Believe their purpose, and live it. So design at Indeed. How did we start our transformation? So we’ve grown, quadrupled in size in just about two years. And in the last two years we’ve set up studios all over the world, and different practice areas. And so as we’ve been growing, we’ve been adding more specialty areas, and I’ll talk about this briefly. Brand systems which is focused on identity, colors, type, et cetera. Design systems, applying specific brand language to components, to have a full stack design system. Content strategy, applying the voice and tone that gets developed from brand systems across the whole organization and the whole experience, design engineering. So that is such a critical part of everything that we do. It’s the reason we’ve been able to move as fast as we have. It’s part DT, design technology, rapid prototyping, part UX dev, we’re looking at UI code but the whole thought is owning fit and finish which is pretty unique and special. Discovery and insights. How do you take research and translate it into experiences. Research, qual and quant. We’re trying to change the definition of what being analytical means. It doesn’t have to mean just an AB test. For us it’s changing it to be every available insight. AB tests, marketing results, qual and quant. Design ops, when you’ve quadrupled in size, you wish you had some infrastructure. Inclusion and ethics, how are we removing bias from our products every day and how are we starting to think about that work. That’s fairly new. And product design. So how do we centralize and align around how we create products. So our mission, we help people get jobs. And then I’ve actually been doing a lot of research on this practical philosophy, Japanese philosophy called Ikigai. And it basically states everyone has a reason to jump out of bed in the morning and it’s really finding that purpose in the middle. I think beyond helping people find jobs, it’s helping them tap into what’s really important to them. Maybe they’re getting paid for something that they’re great at, but they’re trying to figure out how can I do something that the world needs or something that I kind of love a little bit more. Or I’m loving it, the world needs it, but I’m trying to figure out how can I get paid and tapping into this purpose. The job search, you know, is really one of life’s most stressful moments. It is up there with divorce and it’s significantly higher than being trapped in an elevator. Everyone in this room is super privileged, myself included, when we think about all of the opportunities that we have. But there’s so many people that are really, really trying to figure out what’s next and have no idea. And so even for us in our privilege, it’s still hard for us to figure out do I take this opportunity or that, how do I negotiate. And so imagine those that really need. And so to complicate things, it’s the journey is not linear. You start with an interview, you muster up the courage to decide to apply and you receive offers. It’s just a whole mess. And people just really want to feel equipped for the journey. And so we’re focused on being a trusted partner and helpful guide by supporting, inspiring and empowering the journey. That’s the ambition. That’s how we want to show up in people’s lives. So we aim to provide confidence in our brand in every step of the way. So just a little bit of our story and I’m going to zip through this part a bit. But we started with two different tracks for our design system. First is Janus. And it’s establishing a foundation that allows us to build for change. So this was what Indeed looked like a few years ago. And we started bay making these very subtle changes. Not a whole lot, just trying to clean it up, like very little change. And what we found was that the results qualitatively and quantitatively were lukewarm. So you make some lukewarm really, really safe bets that didn’t pan out so we went a little bit further. And we introduced Janus, which really isn’t that radical, but for Indeed was monumental. You know? And we played with the colors, lightening it up a little bit, introducing iconography, going back to Helvetica, a card system. All of this was new and different. Illustration and then e-mail. And the goal was really increasing trust, broadening appeal and neutral performance. And so it’s really, really important as we talk about building love and how that needs to happen internally for us it meant really, really keeping an eye on how things were performing. Getting to neutral performance actually is no easy feat because we would launch lots of tests. So over 66 million users, 100 experiments over the course of 2 quarters. Any time that we launched anything, it would turn red and then we would just do this quick shuck and dive to try to get it back to green. But letting everybody know that hey, we are committed to making sure that the business wins. That’s really, really important. Your priorities are our priorities. So then the second piece is this brand system piece of it. So evolving our identity. So in a competitive landscape that’s constantly shifting, the best experience will win. And so this is where the experience matters and preference kind of leads out a little bit more than performance. The stakes are higher. And so we’re the number one job site in the world but most people still don’t yet know us. So as we step into the next iteration of our design system, we’re really going to be focused on how we’re building trust. And then we kind of think of it in two different ways. The first is coherence and velocity was our foundation. And then the next phase is distinctiveness. So our first design system has been adapted across over 100-plus different products. And our president, this is where you get real, it takes time to build trust and show that you really care about the business. And to have our president attest to how our products are empirically better now because of our design system that we’ve evolved the aesthetic and we’re actually better at helping people get jobs. Illustrations are adding personality and a human touch to the work. We simplified our job search so that it’s a little bit easier. We’ve streamlined finding candidates. And we’ve helped top brands do a better job of telling their stories on our platform. So what’s next? For our design system, we’re just getting started. You know, I think it’s really, really important for everyone in the design system industry to just know that it’s a long game. I think everybody thinks oh, two years. It’s really important to celebrate like every win as your going. So for us we feel lake we just built up a lot of momentum and we’re getting started. Can anyone recognize what this really, really jagged screen shot is? Miss Frizzle from the Magic School Bus. I have a three-year-old who’s obsessed with her. I was watching this episode, I don’t know if you guys remember, but there are a lot of terrible puns, like awful puns. This one in particular is her best friend, Miss Molly, wait for it guys, Kule. And they’re at a car wash. They’re getting her car washed and she talks about the properties that make the soap clean the car or the properties of the molecules that communicate the slipperiness of the oil. But that the molecules are what add this definition to the groupings of atoms. So when you take Brad Frost’s system, you see we’re very much at an atomic level and we’re working towards adding distinction and definition. Molecules onward is where you get it. And as far as you go pages you see more expression of your brand that way. And for our culture, we’ve always focused on our customers and putting them first, but we don’t always ship things that are customer-centered. So how do you make innovation a habit? How do you make building love into all of your experiences just like a part of the way that a business gets done? So this is just your standard design thinking chart here where you start with the human need, you talk about what’s viable, and what aligns with your business needs and then what’s feasible from a technical aspect. So folding this in to everyday work, and thinking about design thinking as a growth mindset and changing the way we work so that innovation isn’t just a separate lab or a separate team, but that it’s a part of the way that we do business. So and also, living our principles. We spent almost like let’s say three months, so with a team of such a large team, we had 89 team members join a Trello board. We had Slacks, we had Wiki pages to put together, I know this is a gnarly slide, all of our principles completing the initial circles I had provided. We started with the why we do what we do, but this is what we do and how weigh do it. So connecting. So we create a unified platform that connects that job seeker or that talent seeker, understanding, how do we understand more deeply how people work and what they need, clarify. I mean, there’s so much anxiety in the whole process on both sides, so how do we make that next step clearer. Crafting for credibility. How do we earn trust and really make it easy for us and for our users to navigate our experiences. And ethical practice every day. That’s again like taking responsibility of the fact that we are global and at our scale everything that we do matters. And what Chris shares is really great. He said let’s just take an adversarial approach to bias, assume we’re getting it wrong. Assume we don’t have it right and it’s actually a bug and every day we should be working towards fixing the bugs. And lastly always iterating, always refining, always improving. So some final thoughts on love. I actually spent a lot of time as Nathan suggested or mentioned before in Munich with an awesome team. From different companies. And when we sat down and chatted about it, like what are your key problems, what are the things you’re struggling with, it was all the same stuff. We focus too much on the short term, and not the long term. What about ethics, what about growth? What about strategic alignment? You know, you think you’re all alone, but here all these companies that are all asking the same questions. And it makes sense. Because we’re all a little over ten years in our awkward teenaged years just trying to figure it out. Some are further along than others, but we’re all navigating how design transformation happens within our companies. So on that note, a little bit of encouragement as we talk about love. Love is patient. With design systems, it’s definitely not a marathon. It’s a marathon and not a sprint. You know, this is a long game and it is a labor of love. And love is kind. We support everyone through change. Internally change is so hard. How do you help engineers work in a different way, how do you help PMs think strategically and embrace a new definition of analytical, how do you make in-roads with marketing so that they’re comfortable with you talking about brand and that you’re comfortable with marketing talking about user experience. How do you really, really build those relationships up through empathy. And then it does not envy with other teams get a lot more love than you do in the beginning, and they don’t understand your value at first. You have to hang in there and the onus is on us to educate, to facilitate, to help others understand, to speak the language, to be that bridge, to be that connector, to be that catalyst for our companies. It always trusts, always hopes, always perseveres. Never fails. I love this because there’s a resiliency that we need to have, a resilience when we go through this. You know, Google’s transformation, that was eight years into it, seven years. Like I said, this is a long game, it’s a long game. So even for my team, they look back and they’re like oh, it’s been two years and we want to do X, Y, Z and I have to remind them we’re on track. We’re two years in, we’re killing it and we’re on track. So there’s a perseverance that we need to have as we do this work. Lastly building love is everyone’s responsibility. So when we start with our purpose, we start with why we show up. It matters because it lights a fire up in everybody. If we didn’t start with what we thought Indeed could be and say hey, we’ve noticed we’re a little transactional, we could be more human. Are we exactly where we want to be at? No. But we’re going to get there. And we’ve been able to move as fast as we have by setting a vision for where we could be. So starting with why we exist, tapping into the mission that everybody already loves, and really, really beating that drum pretty hard. I think everybody thought I was only a brand designer. I think people probably still think that, because I only talk about brand — not only, but mostly talk about brand and love, because that’s where it needs to start. That’s where the revolution happens. And charts the course further. So that’s what I will leave with you. Thank you. Wonderful talk. So let’s start the conversation with a practical way with you’re into design systems, you’re at a design system conference. Is it important that a design system creates its own identity and if so, why is that important? Absolutely. I think it is mission critical that it does create its own identity. I also consider the progress of that, knowing that it starts in an atomic level. There’s these little decisions that make a really big impact, like the roundedness of your buttons. I mean, this is like where the details of the love come into play. I think that you can be distinctive in all of the little details, knowing that you’re building towards something bigger. As you worked on the design systems at Indeed, I want to relate that slide where you talked about Indeed’s customers and their most stressful life moments. Design systems have lives. They’re born, they live, they grow, they do die. And so can you talk about some of the most stressful moments that your design system has encountered at Indeed? Well, it’s like, you know, for us it was like 14 years of this is the way we roll and this is how we do things and trying anything new is just sometimes it’s a bear. Because it just is. And so I would say the new point like where you’re just starting out, you’re just talking about the value, you’re just trying to promote it, and then the other painful point is when you’re outgrowing it. Which is kind of where we are now with our system, where it needs to mature and we’ve kind of hit the limitations where it can be in its nascent stage and wanting to ramp up. Like limitations with not having enough components, limitations with how, because it’s not as mature, because we don’t have like a robust library of assets, like I feel like if we had photography, if we had just more, it would make it easier. Awesome. So I really geeked out from your slide that had the what we do and how we do it. It had seven column, it had multiple principles per column. It spoke to an architect mind to think about level at a mission. Just before you showed this Trello slide with sliding back and fourth and 80-plus people involved. In what ways did you take those principles and have them seep into Trello and slack how do you get them to seep into everything you do? It’s a really great question. Firstly for us it meant involving anyone. So with all of those different offices, we had workshops. So we have an amazing content strategist that literally held design principles, workshops in each location. So with everybody participating in it, it made it theirs. It wasn’t a top-down, leadership said these are our principles and we’ve got them and we’re stuck with them, it’s actually we created these principles together. And leadership we took a look at it and helped to consolidate or amplify one that might have been buried. Like ethics we put that to the top level. So it was really nice for it to be very grassroots. Get everyone’s engagement. And then they become like promoters of it. So when I was in Austin various continuing, someone mentioned he whips the principles out when he has the conversations with PMs or other partners to say actually this is important to us. It’s a part of our principles. So we’re just getting to the part of designing posters around them and putting them up. But because it’s already in the culture, it’s not just a frivolous poster. It’s not one that no one will recognize or appreciate. That’s a really, great question. So some of the questions that we ask ourselves is we think about even as simple as color, which is something that I go to all the time. But with such a saturated market around blue, like we lead with blue, is that the color that best represents us today. There’s so many choices that were made initially with the brand that it’s worth revisiting. So when we talk about distinctiveness we think about color, we think about type, we think about iconography. I feel like this is true for your presentation as well like design systems, you start with those three core things and branch out from there and illustration and photography. So for us we want to get to the full picture a little bit faster so that we can be more distinctive. So we live in an impatient world. As design systems practitioners we have a kit of parts that we hope other people use and you focused or you emphasized that you look towards the long game, the long term to have patience with that. So how do you have conversations with people that are really only focused on three months of a road map or six months of a road map? They see what’s in front of them and those are their priorities. How do you blend in this notion of a long term and being patient for it? It’s a really great question. For us I think that’s why you always have to double track. So we’ve been working on Aurora since day one. So Aurora and Janus we were working on both of them at the same time. So we’re always like keeping an eye towards where we could be and pushing things further and then making choices for the day-to-day that could enable that team and unblock that team. So we felt like Janus would like solved for what people needed, like the first year and a half. And then Aurora is picking up our next segment. Where you need them to go. So speaking of where we need to go, this is the last question and it’s a personal one. I’m a stats guy. I have a master’s in statistics. That’s where my education and thinking comes from, from an analytical bed and you phrased more than once, you need to embrace the new analytical. What does that mean? I know for us it means every available insight. So a new look on that is not only looking at the numbers. It’s also considering what we don’t — because I guess what I’m trying to say is the quantitative side of things are really critical, are really important. They tell you what people do, but they may not tell you why people do it. And so you need the whole picture of quant and qual together and consider that as being analytical is what I’m trying to suggest. Redefining what it means to be analytical as something that embraces, as a practice that embraces both qual and quant. I love that because as a statistician I draw strong contrast with math which is the study of certainty an truth and stats which is the study of uncertainty how we develop inferences and perceptions and try to get down to the trigger of causality so I really appreciated your talk. Let’s give Kim a big round of applause.